It's a world of magic. Torn from his family and thrust into that world, 16 year old Nicola, a boy with a disability who thought he had to stop dreaming, has to solve the mystery of another teen's disappearance before time runs out. 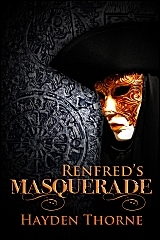 Add your review of Renfred's Masquerade in comments! Awesome! I'm intrigued by the disability. Hayden Thorne is so prolific!